Knowing that everyone is different when it comes to their best ways of being productive, I came up with a countdown of my ten favorite productivity tips that can be applied by any busy business owner or entrepreneur. I aimed to include just the right amount of specificity so any business professional can benefit from these tips and increase their productivity by leaps and bounds. So stop surfing the internet for answers to your productivity woes. Start right here and use these tips as your foundation. 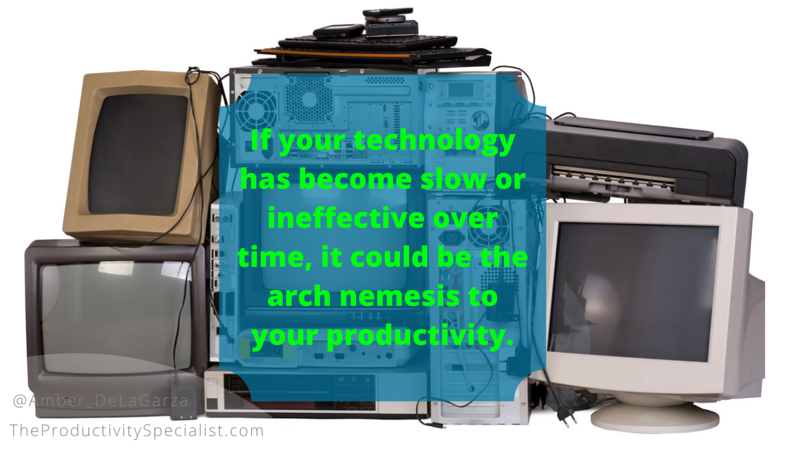 If your technology has become slow or ineffective over time, it could be the arch nemesis to your productivity. Settling for less in your business costs you time, energy, money, lost opportunities, and clients. Don’t wait until it is too late and you’ve completely lost working efficiently altogether. Upgrade your technology as needed. That may mean buying a new phone, hard drive, or printer. Stop settling for less because you and your business deserve MORE! Do not attempt a complete technology overhaul all at once. Make a point to upgrade only one system or technology in your business that demands your attention at a time. Get it set up and functioning properly then move on to the next needed upgrade. Creating a task list forces you to get all of the to-dos out of your head and enables you to determine which ones you need to do first. Stress comes from the feeling of not knowing what needs to be done and not being able to complete everything but you don’t needto do everything – at least not right now! You just needto complete your priority tasks and projects. Other tasks can wait and should be prioritized that way. Utilizing a digital task list enables you to prioritize with ease and most effectively and efficiently manage your tasks. As work environments become increasingly demanding it only makes sense that if we want to be efficient and productive, we should attempt to excel at multitasking. The problem is attempting to multitask risks our most valuable asset, time, because multitasking is a lie! We are not capable of doing two activities at once and doing them both well. When you think you are multitasking you are actually just alternating back and forth between tasks rapidly, neither of which are receiving your full attention. When you buy into the lie of multitasking you are condemning yourself to feeling overwhelmed, inaccuracies in your work, and poor communication with others. Being efficient requires you to focus on one activity at a time so all of your effort and brainpower can be concentrated on accomplishing that activity well. Complete one task then move on to the next for maximum efficiency. Disorganization and visual clutter is very distracting and creates a feeling of being overwhelmed. If your workspace is a mess, it’s hard for your mind to not be. An organized workspace enables you to focus on the task at hand and decrease the amount of time it takes to complete each activity. It also helps you find needed items much more quickly. An added bonus of keeping an organized workspace is that it portrays a high level of professionalism. Why would a client trust you with their important files if you can’t even maintain your own? 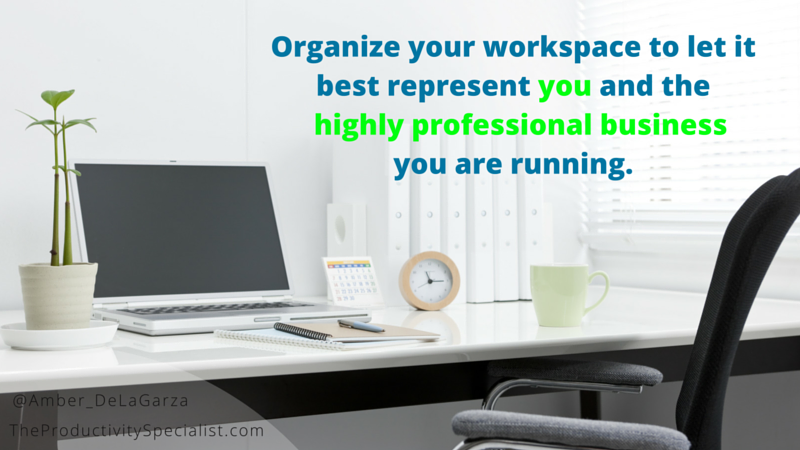 Organize your workspace to let it best represent you and the highly professional business you are running. Working through breaks may feel like a productive use of your time but it’s not. It’s important to take scheduled breaks so you can return to work with a fresh pair of eyes and renewed focus. Walking away from your work reenergizes you to be able to complete tasks with increased focus so taking breaks throughout the day is essential. A break can be any activity that relaxes, re-energizes, or relieves stress. Eating a healthy snack, stretching, taking a brisk walk, reading an industry magazine, and making a personal phone call are examples of ways you can take a short break to rest your mind for a moment. Schedule at least a couple of breaks into your workday for increased productivity. Business email users received and sent an average of 121 emails a day in 2014. That’s more than 44,000 emails per year! Like most business owners, you likely lose emails, information, and opportunities as a direct result of receiving so many emails yet not deciding to act upon them. Scanning through emails and leaving many of them to deal with “later” or perhaps “cherry picking” which emails to respond to results in a cluttered inbox. Checking emails throughout the day is a costly mistake that increases stress as well. Peter Drucker said, “There is nothing as useless as doing efficiently that which should not be done at all,” and he’s right. Like most business owners, you probably overcommit yourself often to activities that don’t bring you any closer to your goals or vision of success. Time is your most valuable asset so it is important to eliminate those activities that are not going to maximize your success. Eliminating is essential to free yourself up to spend your time on your high priority activities and that often means having to say no. According to Warren Buffett, “The difference between successful people and unsuccessful people, is that really successful people say no to almost everything.” To determine if a proposed activity or meeting is worth your time, filter it against your goals. If it’s not, choose one of these two options: delete it or delegate it. Delete – If the activity is unnecessary, does not provide appropriate value, or does not align with your goals, stop doing it. Delegate – If the activity aligns with your goals or is a necessary evil but is a wasteful use of your time, delegate the task to someone else. For example, if your time is worth $50 an hour, don’t spend an hour running a dry-cleaning errand that your assistant could do. Spend that hour working on priority tasks that only you can complete. Time blocking is a powerful strategy to promote focus that involves purposefully allocating chunks of time to completing a specific task or project. Essentially, time blocking means creating smaller, task / project-based goals for your time. If you don’t utilize time blocking, you may never “find the time” to complete some of your high priority task or projects. To effectively time block, identify the best times you have open in which you can get focused work done. Plan out periods of around 60 – 90 minutes on your calendar and label them as the project or task name then work all of your other tasks around those times. Hold those blocked out times with yourself sacred because time blocking can only work for those who stay committed to doing it. To see the full benefit, you must hold the meeting with yourself as you would a meeting with your client, including following the rules of no phone calls, emails, internet surfing, or other distractions. As Stephen Covey says, “You must begin with the end in mind.” That statement holds true for every project you undertake and every goal you set out to achieve. If you don’t know where you are heading, every shiny object/project/opportunity/app/program will look like a great thing to spend your time on. You can steer clear of getting sidetracked by setting goals, aligning your activities to match, and staying focused on pursuing them. Productivity all comes down to this… you must consistently invest your best time into your best activities! Many people think they’re either born productive or not. They think they can’t change and they’re wrong. Being productive is a choice. Productivity is not about getting everything done! It is about getting done the activities that bring you closer to achieving your goals and vision of success, and anyone can do it! Prioritize your tasks so you can purposefully allocate the majority of your time and energy resources to your highest priority tasks – those which align with your goals. Invest in the right activities and you will be more effective, more efficient, and reap the benefits of being more productive. Implement all of the Top 10 Productivity Tips For Busy Business Owners and consistently utilize them to also decrease your stress, grow your business, and free up time to spend on non-work related activities you enjoy that can enhance your quality of life. productivity strategy you found in these tips.